After years as a live show, almost 300 episodes of the podcast, and now beginning its third season, it is incredible how adaptable and successful the formula is for Comedy Bang! Bang!. Each iteration allows the show to conform to a new format, using every version to its strengths. The live show—which now only exists with the occasional tours—is the most restrictive, with the stage and the audience’s imagination being the largest tools at host Scott Aukerman’s disposal. The podcast—still the best version of the series and the funniest podcast available—relies heavily on both imagination and the chemistry between Aukerman and his open-door policy towards guests. With Comedy Bang! Bang! the TV show, the franchise is at its most ambitious. The TV show takes those abstract ideas and makes them a reality. While on the podcast or the live show, one comedian can have almost a dozen of his characters commit suicide on air or throw an in-studio beach party, the TV show must figure out a way to make this craziness real. It’s not only Comedy Bang! Bang!’s biggest obstacle, but also its greatest strength. “Patton Oswalt Wears A Black Blazer and Dress Shoes” is a perfect example of how Comedy Bang! Bang! utilizes TV in an excellent way that stands apart from any of the show’s other mediums. The pace is much faster and they try so many different ideas from any of the other versions of the show, while still maintaining that great CBB spirit. 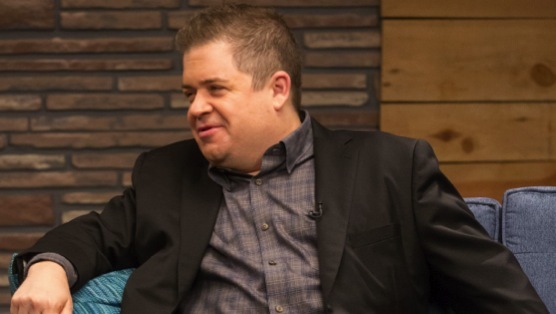 Each season premiere has started with a former CBB podcast guest, such as Zach Galifianakis or Andy Samberg, but none of them have been as much a staple of the podcast as Patton Oswalt. As heard on his latest appearance on the podcast, where he’s confronted with an alien named Qthor and new CBB favorite Traci Rearden, Oswalt is game to go along with any scenario and almost becomes like a co-host to Scott “Meet thefockerman” Aukerman. In this season premiere, we get two different groups of criminals trying to steal the CBB set with hilariously bad special effects and an incredible, escalating death trial because Aukerman accidentally opened Reggie’s—sorry, Ryan Watts’—mail. In the spirit of “Attaboy or Tsk-tsk,” we get a great new game called “Winner or Sinner,” in which people at a coffee shop are asked to keep an eye on a computer for another customer and are judged “winner” if they keep watch, or “sinner” if they do not. As with most Aukerman games, there are many more layers to it. Two computers are introduced, fights break out, and babies are born. It keeps going on for far too long, which makes it even funnier. It’s the highlight of this season premiere. But of course it’s the great guests interacting with Aukerman that always make CBB so wonderful. Aukerman interviews Oswalt with certain (obviously pre-discussed) topics, but the improvisational feel does make it fantastic. It’s easy to see the podcast of Aukerman sneak out when he asks whether or not Oswalt—having been born in 1969—was also conceived in a 69 position. When Aukerman asks Oswalt what his favorite Star-related thing is: Wars, Trek, Search or Bucks, and Oswalt replies “Star Jones,” it makes you want to join in on Aukerman and Watts’ slow clap. Jerry Minor’s appearance as Mailman Manny with the CBB Mailbag is reminiscent of the show’s clear influence, Pee-Wee’s Playhouse and Mail Woman Reba, yet of course CBB gets much darker with Manny than Pee-Wee ever could. SNL’s Vanessa Bayer appears as Doctor Susan Armhold, a turtle expert who is tired of turtles and reverts to a childlike state to comfort herself. This first episode is lighter on guests than some episodes of the TV show, but it’s nice to start with a calmer episode in a season sure to be full of insanity. IIIIIIIIIIIIIIIT’s BEEN too long since season two of Comedy Bang! Bang!, but “Patton Oswalt Wears a Black Blazer and Dress Shoes” is a welcome return to the show and a fine primer into what this show can be for longtime fans and newcomers. Last year the Comedy Bang! Bang! podcast was known for being one of the show’s best, and there’s no doubt the TV show could follow in line.